Oh, I love this! That pink centre is so striking! You do know what you're talking about! And I agree!! A perfect spring quilt! I love that block and it's a very pretty quilt. Oh yes the sashing seemed to tone down the quilt. Can't wait to see your finished top! Pink is a difficult color for me to use in quilts. In your quilt, it might be the photo but the pink does "hide" the bottom right block in the center. However, adding the sashing did add a different perspective and it is a now glorious Spring quilt. I learn a lot from reading your blog, Thelma. Much better! You were spot on with your sashing width choice! It's strange. When the pinks were touching they seemed brighter. I like them much better after adding the sashing. Good job. You sure do know what you are doing! It is so much better with the blue cornerstones. Not a fan of pink but this is very nice indeed. I love the quilt, and the fact that you are never afraid to improve on a pattern! The pink center scared me too, but after the sashing I really, really like it. It gives your eye a place to rest. 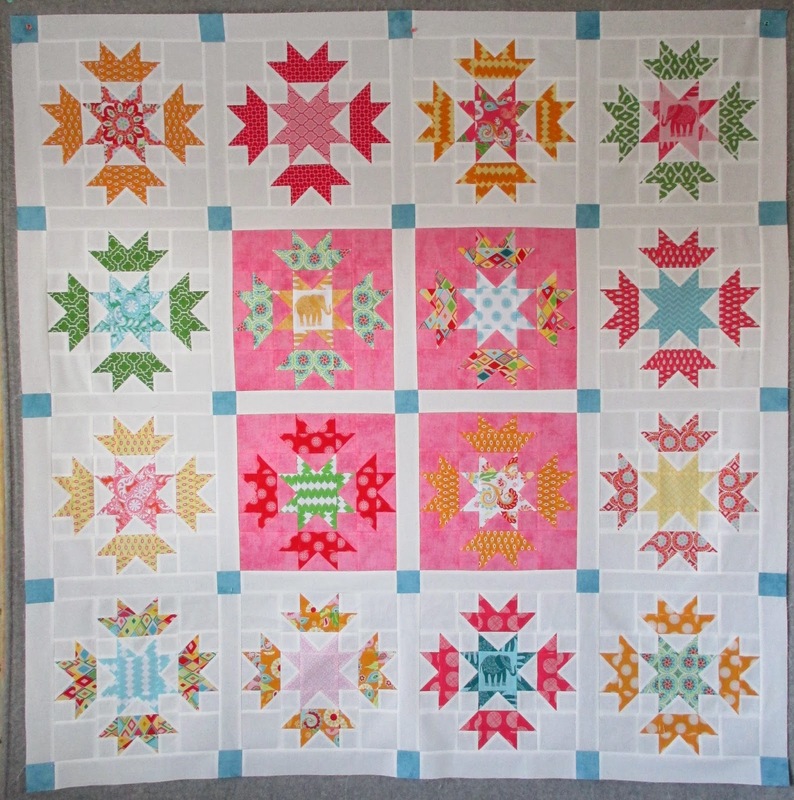 What a warm and cheerful quilt! I like your version better than the original. Great job (as usual). Personally, I like it. Looks like summer and fun. The pink combined with your sashing is wonderful! 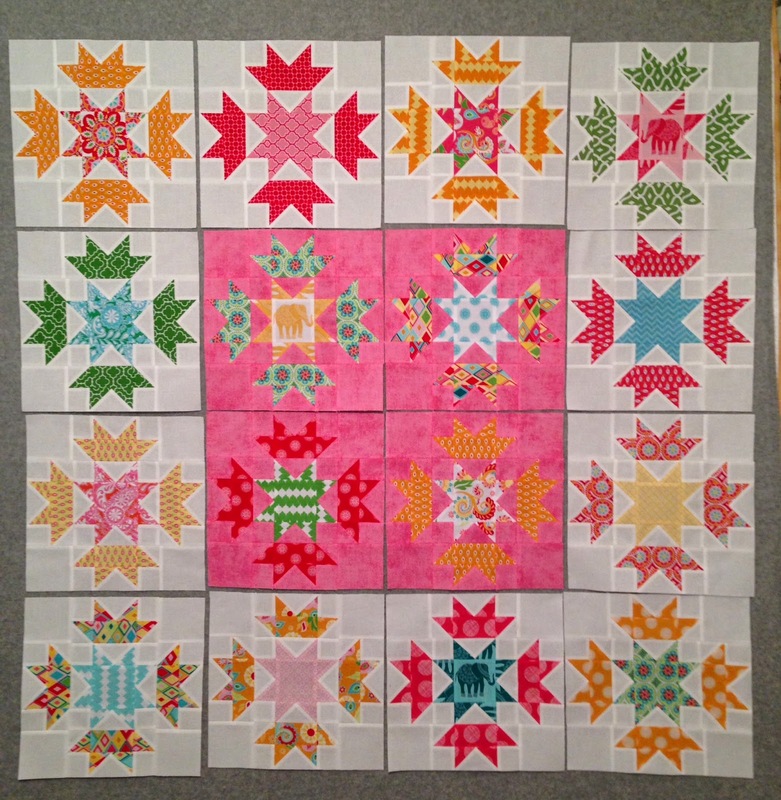 I agree with you that it needed broken up a bit, but the colored blocks add such a happy, summery feel to the overall quilt. Those blocks are beautiful! I really like it. Kind of looks like a medallion. And I agree with you about the blue. Last week was a whirlwind for me, and I missed this post, which happened to be my birthday, glad I had a few minutes to get caught up, I like what I'm seeing!! I really like adding the sashings and blue cornerstones - Love the block! !